Marketers often wear multiple hats, but their role as SEO specialist is becoming more prominent. Considering that 93 percent of online experiences begin with a search engine, it’s a marketer’s job to make sure his or her brand is as visible as possible on search engines. True SEO involves manipulating parts of a website that users can see, such as on-page content, keywords and images, as well as behind-the-scenes elements like the structure of your site, page speed and how your content is delivered. For these elements, front-end web developers can help run technical SEO audits— like a check-up at the doctor — to make sure our web pages continue to rank in search. 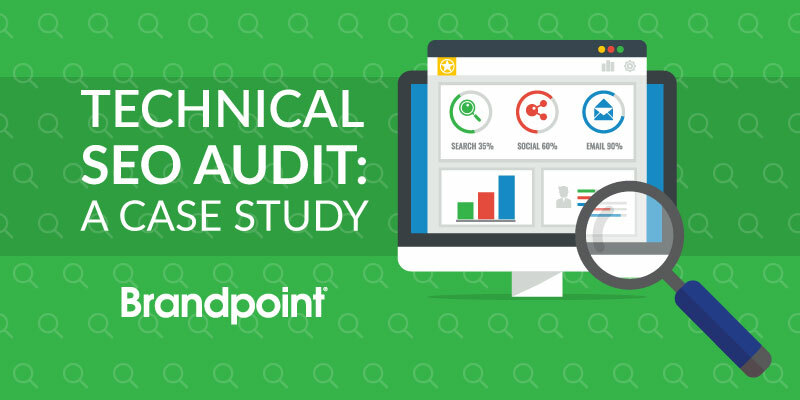 In this post, we explain our process for running a technical SEO audit on brandpoint.com, how to identify and reapir the issues, and the final results from making the repairs. Search engines better index your website’s pages: Search engines like Google and Yahoo! assess 200+ factors to determine where your site appears in search results. Improve search engine position: A higher position in search results means more exposure for your brand and a higher chance of driving organic traffic to your site. Boost your site’s overall performance: A better user experience encourages visitors to stay on your site and browse more content, resulting in long-term SEO benefits. Our website that you’re on right now (www.brandpoint.com) was experiencing lengthy page load times. Visitors saw a blank or partially loaded screen before they were able to fully access content. This is poor performance in the eyes of search algorithms: If a user clicked away from the site, this was a flag to the search algorithms that brandpoint.com was not a fast, reliable result. We used a combination of tools to establish a snapshot of the site’s average performance, then took this data and identified the most severe issues. We determined that fixing the page speed was our best opportunity to improve SEO performance. The fully loaded time of Brandpoint.com was 20.8 seconds. This is an insanely long time for a site to fully load. Search engines penalize slow-loading sites because users want (and expect) a fast, smooth web browsing experience. Consequently, sites that offer a slow load time will be placed lower in search results. Ideally, pages should only take one second to load. Unfortunately, achieving a one-second page load is virtually impossible for citizen websites. Without the server farms and technology budget of a tycoon like Google, us regular folks can’t do that. Still, there are a few things we can do. Modified the parameters of browser cache settings. Served scaled/compressed images to minimize request size. Removed unused or out-of-date WordPress plugins and themes and deleted duplicate or redundant content and images. Implemented a global Content Delivery Network (CDN) to ensure that content is available as close as possible to the end user. These tend to be common best practices for web developers, and the results prove why these tend to be go-to fixes. Over the course of a few weeks, we observed the effects and benefits of these changes, and continued to monitor and re-test at intervals. However, we saw immediate, visible changes, even before doing any additional adjustments. We initially improved the load time from 20.8 seconds to a cool 8.1 seconds. We also changed the total page size from 10.9mB to 7.54mB — a smaller page size means that there’s less work the pages have to do to load, which also helps increase the load time. Five days later, that had improved even more after the third round of adjustments and re-testing: the fully loaded time was down to 7.4 seconds and 6.89mB total page size. The biggest improvements came from upgrading our content delivery with a CDN. By allowing our visitors to access our content from the network server closest to their physical location, we were able to provide drastically faster page load and a much better overall user experience. This decreased click-back rates and boosted our search results positioning. 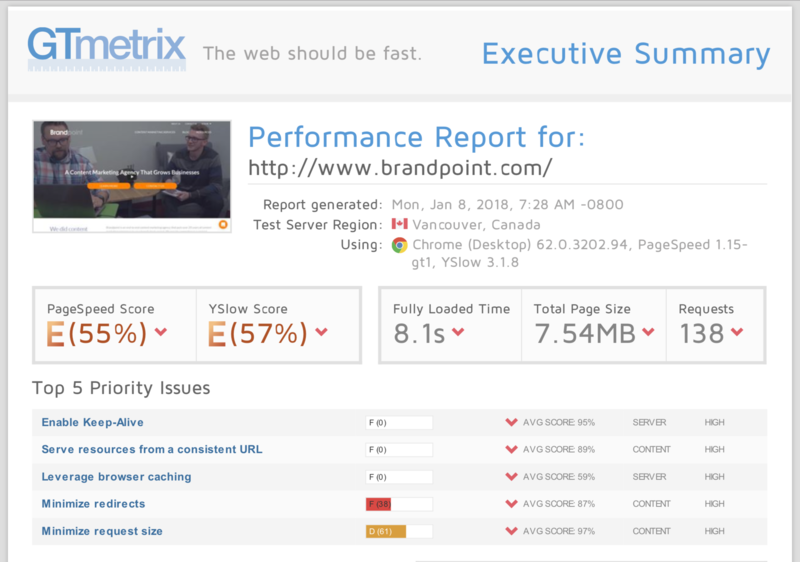 Currently, visitors enjoy fast page load times, a reliable content presence and consistent actions and locations of exactly what they’re looking for on brandpoint.com (and we’re always finding ways to make our web experience even better!). 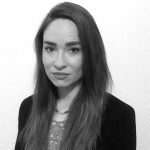 By running a technical SEO audit and focusing on making these repairs, our marketing team is able to create high-quality content and host it on a reliable website. They know that their hard work is worth it when the website supports optimal SEO performance, and our business benefits by having a strong presence in search results. Is your website performing at its best? Brandpoint’s technical audit will identify all the issues for your site, conduct repairs, create a better user experience and improve your SEO.